Second generation Texas sweeping contractor continues to expand into new areas to fill customers' needs, while stressing environmental methods. In 1986 Bob and Zuella Stumpf decided parking area sweeping was a good type of business to start. For the next 17 years they operated their company with diligence and hard work, becoming a force to reckon with in and around their Paris, Texas, location. In 2003 their son, Bob Jr., retired from the military and came back home. 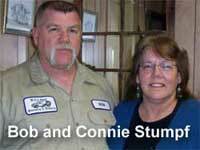 Before long, he and his wife, Connie, got back into the business Bob had grown up in. In the interim, his vision for what his customers need, coupled with a seemingly insatiable desire to do whatever he can to assist them with any property needs that arise, has moved BZ and Sons into a three-state operation. "My wife thinks I'm crazy sometimes, and an example of that was when I decided to expand into street sweeping," says Bob Jr. "However, I did my research -- much of it on WorldSweeper.com -- and got a handle on my expected costs of consumables, among other requirements and factors. In fact, that research is what pointed me away from my planned TYMCO 600 purchase. "I realized through my research that, getting TYMCO's 435 model instead, I could still venture into street sweeping. However, if that didn't pan out, the 435 could still be used for my core business of parking lot sweeping, as well as construction cleanup. That was the correct decision, even though we've expanded that area of the company enough that we've added a TYCMO 600, as well." The last year heralded two new areas of expansion, as well. One was in the area of 'recovery pressure washing,' which Stumpf recognizes is the wave of the future for property managers. "Our power washing equipment now can be used with up to 93% water recovery," offers Stumpf. "Regulations are now pushing that type of power washing; in some cases, you even have someone looking over your shoulder to make sure you're doing it that way. Clearly, this is better for our customers, for their environmental reputation, and for the environment itself. We see it as a 'win/win' area of expansion for the company." Alert to additional opportunity, when they were asked about distributing icemelt by a national chain, they added that new service on a substantial scale this winter. Stumpf says that's already become a good add-on for them. In his audio interview, Stumpf offers a number of suggestions for both contractors and property managers. "I've come to realize that property managers often just let contractors come in and tell them what they can do. That's a lot easier on the contractor than if the property manager develops a list of questions for the contractor to respond to. If they'll take the time to do that, they'll be much more likely to get a contractor that truly can handle their personalized cleanup and other needs." 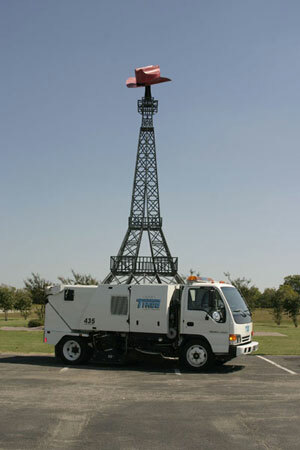 Everything is reputed to be bigger in Texas, and the "10-gallon hat the size of a Volkswagen" on top of the Paris, Texas Eiffel Tower replica is no exception. For BZ and Sons, it represents a yardstick on the type of service its customers can expect. The audio interview with Bob Stumpf, which is linked below, provides an in-depth look at how BZ and Sons has prospered in a time when others have foundered. Note: The following audio interview with Bob Stumpf, Jr., approximately 34 minutes in length, will play without downloading any files onto your computer. If you hear the interview at 'chipmunk speed,' you will need to download the latest version of Adobe's free Flash player. Bob Stumpf may be reached via email sent to info@bzandsons.com. The company's website is www.bzandsons.com.